Initial Claims for Unemployment Insurance fell to 450,000, a drop of 3,000 from last week. That is good news, but only in terms of the direction. After several weeks in a row of new claims shooting higher, the upward momentum has been reversed, with four straight weeks of declines. A few weeks ago it threatened a break out to the upside (see graph below from http://www.calculatedriskblog.com), but now we are smack dab right in the middle of it again. While we are still comfortably below the year-ago level of 559,500 on the moving average, back then the average was falling fast. To really start to put a dent in the vast army of the unemployed, we really need to see the four week average fall below 400,000 level. If the four week average moves above the 500,000 level and stays there it seriously increases the risk of a double-dip recession. The current level of 450,000 then is sort of in the “no man’s land” of neither a strong recovery that will bring down the unemployment rate, but nor a renewed downturn in the economy. That is consistent with the sort of “semi-recovery” the economy has been in for most of the year. The news on continuing claims was encouraging, at least on its face. Regular continuing claims fell by 84,000 to 4.478 million. That is down 1.628 million or 26.6% from a year ago. That, however, gives a very incomplete picture of what is going on. Regular continuing claims are paid by the state unemployment insurance funds and only last for 26 weeks. In August, half of all the unemployed had been out of work for more than 19.9 weeks, and 42.0% had been out of work for more than 26 weeks. While the last two months have seen a dramatic decline in the median duration of unemployment (it was 25.5 weeks in June), it remains far higher than any level seen prior to the Great Recession (the previous record was 12.3 weeks). 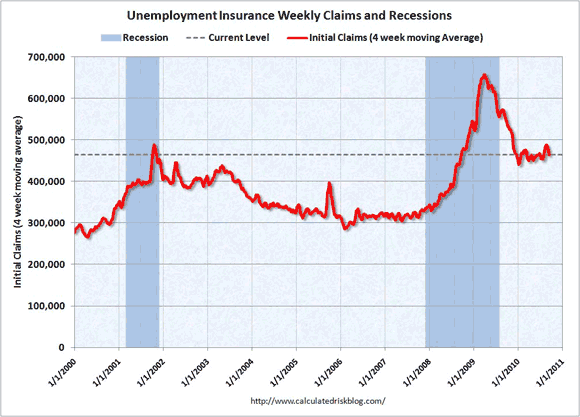 After the 26 week mark is hit, people move over to extended unemployment claims, paid for by the federal government. In every recession since the end of WWII, Congress has extended benefits. This week (actually two weeks ago, as the extended claims data is a week behind the regular continuing claims data, and two weeks behind the initial claims data) extended claims fell by 508,000 to 5.470 million. It is 978,000 (24.5%) higher than a year ago. Extended claims plunged earlier in the summer, but that was due to a senate filibuster that cut off benefits to over 2 million. When the filibuster was overcome, those people streamed back onto the extended benefit rolls. This time around there is no such factor driving this rather dramatic week-to-week decline. A better way to look at the data is the total number of people getting unemployment benefits, regardless if the state government pays or the federal government does. On that basis, total claims fell by 592,000 in the last “week” and are 640,000 (6.4%) lower than a year ago. What is not known is the total number of people whose benefits have run out and thus are not being counted. If it is because they found new jobs, then it is great news. But extended benefits do not last forever. The maximum, which only applies to the areas of the country with the highest unemployment, is 99 weeks — just short of two years. The economy was already in recession two years ago, and we just passed the two year anniversary of the collapse of Lehman Brothers, etc. That is when the economy really fell off the cliff. If people are simply “aging out” of the system, that is very bad news, mostly for them, but also for the economy as a whole. Clearly it is not good to have so many people unemployed, but it is better that people are getting benefits rather than being left with no income at all. Unemployment generally (it varies a bit by state) pays 60% of what people were earning before they got laid off, up to a cap of about $400 per week, or $21,000 per year. If we assume that the average benefit is $300 per week, then it means that $2.6 billion a month more is being pumped into the economy. It is going to people who will spend that money right away. That means more business for Wal-Mart (WMT) and Big Lots (BIG). It means that these people are able to continue paying their mortgage or rent and don’t become homeless. It means that their electricity is not shut off. It means that they still can have an Internet connection from which they can continue looking for work. It is not just the humanitarian benefit of making sure that our fellow citizens do not slip into third-world-style poverty — it is that the money gets pumped into the economy, and as it is, it keeps other people working. It is for that reason that the non-partisan CBO has found that extended unemployment benefits is among the most effective programs around at stimulating the economy on a job-saved-per-dollar spent basis. Moody’s analytics has come to similar conclusions. The table below is from the New York Times and based on Moody’s data. Note that extending unemployment benefits is far more effective on a bang for the buck basis at raising GDP growth than is any tax cut, particularly extending the Bush tax cuts. The Boehner “two step” plan of reducing non-security spending back to 2008 levels and keeping all the tax levels unchanged for the next two years (which presumably also means an estate tax of zero) looks almost like a deliberate attempt to sabotage the economy in the light of these “bang for the buck” measures of types of fiscal stimulus. Food stamps would be cut drastically — not just the increased amount per person that were part of the ARRA — but since then number of people getting food stamps has increased dramatically during the Great Recession, the level would have to be cut well below that to bring the total amount spent back to 2008 levels. In September 2007 there were 26 million people on food stamps; by September 2008, that number had climbed to 31 million, and by June 2010, the latest data available, the number was up to 41 million. Thus to get spending down to 2008 levels, not only would the 12% increase in the level have to be rolled back, but benefits per person would have to be chopped by 24.4%. Thus we replace $1.72 worth of economic activity for each dollar of spending with $0.35 per dollar spent. Extended benefits would have to be cut off, removing $1.60 of activity with that $0.35 worth of economic activity. While one should generally not ascribe malice to that which can be explained by incompetence, I have to say that it is hard to do so in such a situation. Is it really possible that the potential future Speaker of the House is that totally ignorant of basic economics? It is just basic bad economics, in addition to the extreme humanitarian hardship that it would cause.